Life finds a way... to look really cool. The latest poster for Jurassic World: Fallen Kingdom got us chatting about iconic, underrated, and simply beautiful movie posters. And we want to know which ones stand out to you as works of art. Jurassic World: Fallen Kingdom director J.A. Bayona recently shared a movie poster he’d commissioned from Fandango and artist Nima Neetz. Granted, it’s not the greatest movie poster that’s ever been created, but it’s pretty large and in charge. It also has that classic “see at all our characters” look. 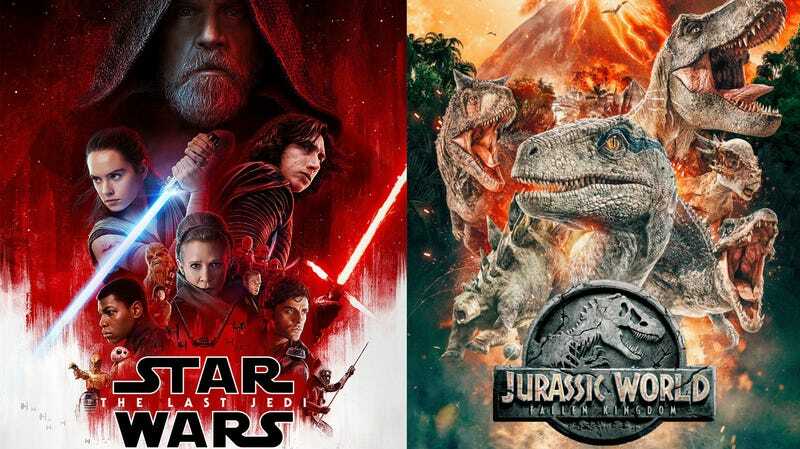 Anyone else notice how it’s very similar to the framing of the Star Wars: The Last Jedi poster (as shown above)? I’ve spent the past few minutes pairing the Star Wars characters with their respective dinosaurs, because it’s Monday and why not, I can enjoy life. General Organa is Blue, obviously—and Luke Skywalker is a volcano because he’s so full of the drama. Beyond the fact that Finn is now canonically a stegosaurus, this poster got us chatting about movie posters that we love. This goes beyond the iconic staples: Blade Runner, Back to the Future, Lord of the Rings: Fellowship of the Ring, Empire Strikes Back. No, we’re talking deep cuts. Posters that inspired you to want to see the movie, or perhaps posters you actually bought because you found them so engaging. Here are the ones a few of my coworkers and I picked out as some of our favorites. You’ll note that two of them feature robots because, come on folks, it’s io9. That’s a given. From left: Pacific Rim (James Whitbrook), Return to Oz (Jill Pantozzi), Wall-E (Beth Elderkin). It’s time to get visual and share some of your favorite movie posters in the comments below. Let’s all celebrate the art of making us want to spend money on seeing things! Open Channel: Who&apos;s the Best Royal Couple in Fiction? Open Channel: What Was Your Favorite Easter Egg in Ready Player One?